Low oil prices and slow job market are boosting Middle East demand for online training; Shortage of locally developed online courses has left the market open for international players, according to GulfTalent's latest study. Professional training courses delivered online are rapidly increasing in popularity across the Middle East, but the supply of suitable courses is failing to keep up with rising demand, according to the latest research by online recruitment firm GulfTalent. The findings are based on a comprehensive survey of 1,600 professionals based in nine countries across the Middle East, as well as interviews with several of the region’s leading training providers. Based on GulfTalent’s study, one in five professionals looking to take up training is seeking an online course. This represents a rapid transformation, considering that a decade ago online training was virtually non-existent. A further 62% of training seekers prefer classroom-based courses supplemented with an online component. Only 18% now seek the traditional classroom-only format. The growth of professional online training could be attributed primarily to its lower cost and greater flexibility for participants. 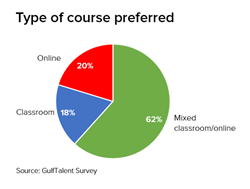 Professionals surveyed by GulfTalent reported having to budget on average USD 1,000 for a classroom-based training course, compared with just USD 500 for an online course. While the demand for online courses is rising rapidly, the supply of courses is not keeping up. According to the survey, 14% of those seeking courses with an online element are unable to find a suitable course for their needs, compared with only 6% of those seeking classroom-based courses. The supply gap is even greater for those seeking online courses delivered in Arabic language, with 23% of professionals seeking such courses unable to find suitable options in the market. In the meantime, with local supply still inadequate, the region’s professionals are resorting to international providers of online training in order to fulfil their learning and development needs. International online training firms are rapidly penetrating the Middle East market, in part by advertising their courses on top career sites such as GulfTalent to reach the region’s professionals. The plunge in the oil price and slowdown in regional economic activity seems to have had a mixed impact on the regional training market. Several training providers interviewed by GulfTalent reported a steep drop in demand for training from corporates, as companies look for opportunities to save costs. However, the drive for cost efficiency seems to be pushing many corporates towards greater utilisation of online training, further boosting demand in this area. In contrast to corporate demand, demand from individuals paying for their own training is steady or even rising, as more professionals seek training and certifications to improve their career prospects in an uncertain and increasingly competitive job market. According to the survey findings, motivations for taking up training include general skill improvement, which was the biggest factor for 52% of professionals, followed by securing a promotion, getting a new job, or making a complete career change. GulfTalent’s survey found that the appetite for training was highest among the region’s IT and HR professionals, with roughly one in every two professionals interested in taking some kind of training. Lawyers reported the lowest demand for training, with only one in four planning to take up a course in the next two years. In terms of subject areas, the survey found the highest demand for training to be Engineering and Project Management, due to the very high proportion of engineering professionals working in the region, followed by Finance. For female professionals, top categories were HR, Administration, Business Management and Education. When it comes to choosing a particular course, professionals surveyed cited the profile and reputation of the training programme as one of the most important factors in their decision. In particular, it was very important for them that they receive a certificate with global recognition. The most popular certificate is SAP, followed by PMP and ACCA. In the case of classroom-based training, location was also mentioned as a key factor, with about 75% stating a preference for training courses that are either near their home or close to their place of work. The fact that such proximity is not always available is further contributing to the growth of online courses. GulfTalent’s findings were based on a survey of 1,600 professionals in full-time employment, based across nine countries in the Middle East. Surveyed countries included the UAE, Saudi Arabia, Qatar, Kuwait, Oman, Bahrain, Egypt, Lebanon and Jordan. The study also drew on interviews with a number of leading training providers active in the Middle East. GulfTalent is the leading online recruitment portal in the Middle East, covering all sectors and job categories. It enables over 6 million professionals to advance their career by connecting them with top employers across 9 countries, as well as helping them find professional training courses or postgraduate study programmes in their field.